Linus has had a cold for the last few days, he's been fine, apart from a pitifully sad looking runny eye. A lack of afternoon nap and some hyperactivity meant he was a little on the sleepy side at story time. 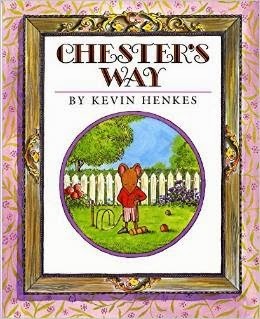 Chester's Way is by Kevin Henkes, it really is a lovely story of friendship and of welcoming new people. Chester is a mouse and his best friend is Wilson, they do everything together, then Lilly tries to join in. It could be easy enough to make this a story of the two friends carrying on regardless, Henkes manages to have a plot that has Lilly become a close friend too. There's a lot in the story and in the illustrations too. It's quite a friendly and homely feeling book. The rear says ages 4 to 8 and I'd say that was almost right, it does feel a little long for Linus but not too much. It's an American import and does have a slightly different feel to some of the British books aimed at a similar market. It is all the more refreshing for it. I won't apologise for reading Lost and Found a fair amount. It's a lovely bedtime story, it's full of humour in both Oliver Jeffers' story and illustrations. It's easy enough to relate to a story of someone finding a lost penguin on their doorstep. It makes me feel sad that when it happened to me I told the penguin I had no room and he left sorrowfully, checking his pockets for loose change as he went on his way. The boy hero of Lost & Found not only takes the boy in but then goes in search of his home. Home, however, is where the heart is and the penguin's heart is with the boy. Sally Hunter has made a number of books themed around the anthropomorphic elephant, Humphrey. It does seem to be a niche marketed character with a following. I'm not sure which came first, the products or the books. The books do seem well written and aren't just thrown together. Humphrey's Bedtime is a pleasant read of Humphrey and his siblings going to bed. It's more of Lottie's (Humphrey's older sister) story as she goes to bed last. We prefer Humphrey's Farm Adventure. Linus may be getting Humphrey's Christmas for Christmas, so I may let you know how that is in a few days, you just all better be good.